Bij de Brug (“Near the bridge”) is a new Bed and Breakfast in Arnhem, not far from the famous John Frost Bridge. The Bed and Breakfast is housed in a characteristic building from 1885 with a monumental facade. 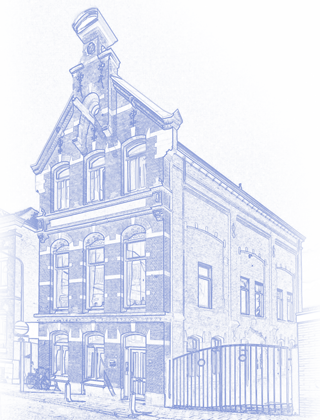 The property enjoys a quiet location in the Boulevard Quarter, on the edge of the Spijkerkwartier. In three minutes you walk to the Musis Park from where you are just steps away to the downtown area with its nice restaurants, terraces, theatres and shops. At Bij de Brug you are welcome to tourism, culture or leisure stay. Also for business and / or longer stay this Bed & Breakfast is particularly suitable. Enjoy your stay in an attractive city apartment and explore the charming city of Arnhem with its many cultural events. Discover the numerous possibilities there are for trips, both in town and to the populair tourist destination of The Veluwe. A stay at B & B The Bridge is a special experience. Our guests appreciate the great room, the decor and comfort. The fact that the location so close to the center of Arnhem, is making this B & B very attractive. The B & B currently has one apartment of 54 m2. You can choose to stay with or without breakfast. At the moment we are enjoying the very extensive, delicious breakfast. As everything was cared for exceptionally well from the very moment of arrival, of course we couldn’t expect not really different. If people have to stay around here, we will definitely refer them to you. A nice and spacious place with an ideal location. Also great to be able to cook something here myself. We enjoyed the city of Arnhem for two days. Made a beautiful walk (16km, Rheden – Posbank – Onzalige Bossen). Delightfully relaxed in this fine B&B! Clean, comfortable and nice breakfast. Thank you Peter for your hospitality! It is a very spacious and tastefully decorated apartment, located in a quiet neighborhood near the city center The breakfast is very tasty and plentiful. The owner is very friendly and we have felt us very well in his apartment. This was a beautiful apartment space in a quiet but central place in Arnhem. Quite luxurious and sparking clean, great bed and lin. Even although we came in late at night and left early next morning, we could imagine spending a few days here as it has all cooking facilities and is self contained. One of the best breakfasts we had while overseas, even catering for some special needs my wife has. Highly recommended and good price.